At Trinity, we understand that giving is an act of gratitude. In thanksgiving for all God has given us, we give back a portion of our resources and our time for God’s work in the world. 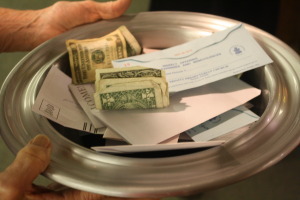 We teach Biblical principles of Christian stewardship, including proportional giving. All giving to the church is voluntary and confidential. We understand that Christian giving is a responsibility, a privilege, and a joy. All financial gifts to Trinity are used to support the church’s ministries of worship, discipleship, and service; to fund witness and mission both locally and globally; and to maintain the church facilities with care. Montlure Presbyterian Camp, the House of Neighborly Service, Presbyterian Campus Ministry, the Presbyterian Church in Sells (Tohono O’odham), Frontera de Cristo and Companeros en Mision (border ministries). Annually, the church receives four Presbyterian mission offerings, including One Great Hour of Sharing, the Pentecost Offering, the Peace and Global Witness Offering, and the Christmas Joy Gift. In addition, two local mission offerings, designated for different organizations each year, have recently provided camp scholarships, migrant packs, campus ministry funds and more.